MT3 / MT2 is designed for various purposes and easy installation in any situation ; Magnetic P/U, Piezo P/U and Low Impedance input. It is fixed by Epoxy in Precision Bass Pickup case which can increase it's flexibility and reliability. 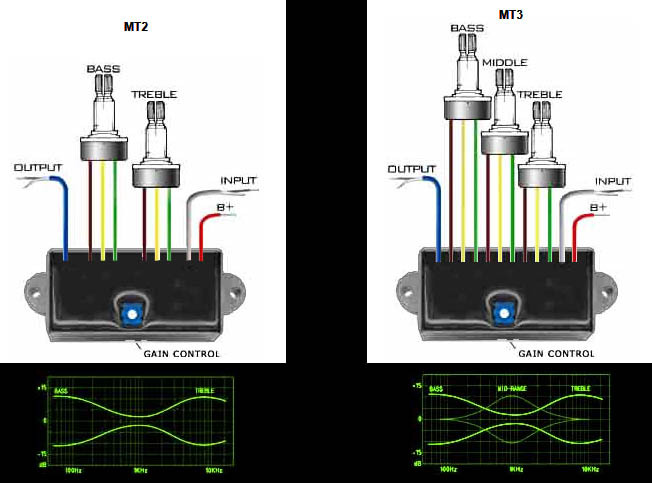 In addition, the wide range of Input and Output level can make MT3 / MT2 more useful in any purpose. It is possible to control the output from Guitar-Level to Line Out Level. MT3 features 3 band Equalizer of Bass, Middle, Treble pots. MT2 features 2 band Equalizer of Bass & Treble pots. Volume, Balance, Select switch is optional. The 9 V alkaline battery life is over 1500 hours in continuous use.